GEORGIA PEACHES AND OTHER FORBIDDEN FRUIT came about because of a radio segment I heard about the insane wealth of some radio pastors. I thought, “What if one of those guys had a gay daughter? 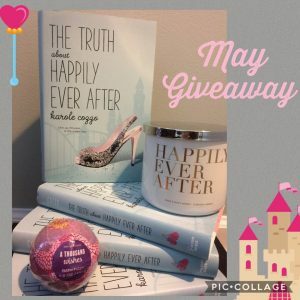 How would that go down?” And though I didn’t end up exploring the wealth aspect (my fictional pastor dad is successful but not obscenely so), I did explore the question of what happens if you’re a lesbian, but also a believer. Ideas often come that way to me. I’ll hear something on the news or in conversation, something as small as a sentence, and then an idea blooms. I try to pay attention and not miss those moments. And what about your characters? Have any real-life people inspired them? Absolutely. In GEORGIA PEACHES AND OTHER FORBIDDEN FRUIT, the love interest, Mary Carlson Bailey, has a twin brother nicknamed B.T.B. He is directly inspired by a former student of mine who was universally adored at the high school where I taught. Like my former student, B.T.B. has an intellectual disability that makes him much younger in years than his actual age of seventeen. I loved creating the true friendship between him and my main character, Joanna, as I saw a similar friendship play out in my art room between the student who inspired B.T.B. and another student. In my first book, NO PLACE TO FALL, the love interest, Will McKinney, also was inspired by a former student. He (the student) was the much swooned-over crush of one of my art students, so I figured if he’s good enough for Savannah, he’s good enough to put in the book. Yes. First, read widely in your genre. You need to know what’s being published and how things are being written, and get a feel for story. Second, find critique partners. To this day, even with four published pieces under my belt, I cannot write without other eyes on the work. Third, don’t get trapped in a self-doubt spiral. Write it. Do the work. If you can’t make it good enough, then lower your standards. You cannot improve something that isn’t on the page. And fourth, have fun! Writing should be joyful — at least some of the time. What was your biggest query mistake? It wasn’t a YA query, but I dabbled with a few picture books and queried with one that I loved. The agent sent back an email that said he liked it and what else did I have. Silly me did not understand that meant more picture books and I sent him the middle grade novel I was working on. Needless to say, I didn’t hear back from him. And you didn’t ask this, but my very first manuscript, which was a middle grade dog story, yep — I sent that out as a first draft to two different publishers. I was that fresh and naive to how the business worked, and also pretty over-confident. Ha! If you could co-author a book with anyone, who would it be? Funny you should ask! I’ve been in discussion with one of my former Pitchwars mentees about doing just that. But, if we’re looking at already published writers, I’m going to go with David Levithan for young adult or Jen Malone for middle grade, because both of them have done a number of awesome collaborative books and they could show me the ropes. It’s a definite writer bucket list item for me! Ooh, great choices (and an opportunity for a shameless plug: Jen Malone will be our July guest author)! So speaking of wildly talented writers, tell us about your most memorable fangirl moment. Who did you meet? What book do you wish you wrote? Um, duh. Harry Potter. It’d be nice to have that sort of career security as a writer. Plus, it’s genius. 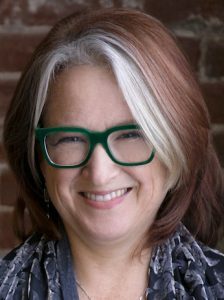 Jaye Robin Brown, or Jro to her friends, has been many things in her life — jeweler, mediator, high school art teacher — but recently she’s taken the plunge into full-time writer life. She’s a Southerner at heart, by way of Alabama, then Atlanta, and for many years just outside of Asheville, but now she’s moved north for a bit of city living. Boston, baby! And though she’d like to think brownstones might find a way into her fiction, she figures kudzu will always be what comes to her imagination first. Her debut young adult novel, NO PLACE TO FALL, came out in the fall of 2014 from Harper Teen. It’s about dreams, singing, friendship, love, betrayal, family, and mistakes. It’s also a love song to small town girls and mountain music. In April 2016, a companion novella, WILL’S STORY: A NO PLACE TO FALL NOVELLA, released from Epic Reads Impulse, a digital-only imprint, and follows Will McKinney’s side of the story. 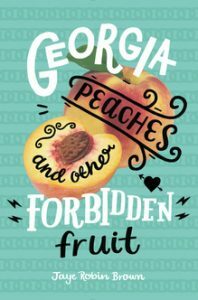 GEORGIA PEACHES AND OTHER FORBIDDEN FRUIT is her sophomore novel. Imagine this: You’re sitting at your desk at work, plugging away at the daily grind. Your phone rings. Not your work phone, but your cell phone. A number flashes with a non-local area code. It could be a wrong number or a salesperson trying to pitch you a “free” cruise (hint: they’re never free). Maybe a family member you haven’t heard from in a long time. Or … it could be a call you’ve been waiting on. Your heart picks up pace. It could be the call. Publishing is filled with waiting, but occasionally, an important call can break up the waiting. One call and everything can change. Writers often dream about those moments. And like much of life, often those calls do not go as we think they will. I was waiting on a dozen or so literary agents who had requested full and partial manuscripts from several rounds of online pitch contests. It was the worst part of winter, with daily gray Midwest skies and continual cold. One morning, on the way to work, I cracked the screen on my cell phone, barely six weeks after buying it. I’d had my phone out of my purse during the drive to work because my mom was driving that morning through the snow to see my grandmother in her nursing home. We’d had few years of ups and downs with my grandmother’s health, but this time, it truly was the end. I was so nervous she’d call and I’d miss it, the phone was on my lap. When I got out of the car, it flew face first onto the cold pavement, cracking. My grandmother ended up passing away the next day. This was the day my now-agent called. Actually, sent me an email. She said she wanted to plan a call — the call? — but New York City was about to be hit by a huge snowstorm and the whole city was shutting down. Could we plan the call for Monday? None of this was how I’d daydreamed a special call would play out. I had the weekend to think over what happened with my grandmother and talk with my family. By the time Monday rolled around, I wouldn’t say things were back to normal, but I had more focus to think about my writing, and about the call. My emotions had been through the wringer, but it was great to have something to feel happy about. When I got my first book contract, I always envisioned jumping for joy and spazzing out. Instead, I heard the news through email and felt rather calm. I had questions. It never really sunk in until months later when I signed the publishing contract. My most recent call experience is probably closest to what I’d always imagined. I’m a member of Romance Writers of America and have absolutely dreamed about what it would be like to be a finalist in their awards — the Golden Heart for unpublished manuscripts and the RITA for published books. I’d struck out twice with the Golden Heart, but this past year I was excited to be able to submit to the RITA for the first time as a published author. Writers submit their books to be considered, so there’s no second guessing whether you are being considered. Finalists are notified by phone calls from members of the board. We all know when call day is. I work from home the majority of my time, but on this day I was in the office at my day job. The phone lit up with a California number. I’d already convinced myself earlier that morning that since this was my first book and my first time entering the RITAs, the odds were not in my favor. I tentatively answered the phone. The caller was a published author and RWA board member calling to congratulate me: Alterations had been named a finalist for Best First Book. I was speechless and shocked. One question I had to ask: Are you sure? It’s hard to predict how you’ll act when an important call comes through. Have you ever received an exciting call? Tell us in the comments!